Do the ghosts and goblins of Halloween have you feeling a little … chicken? 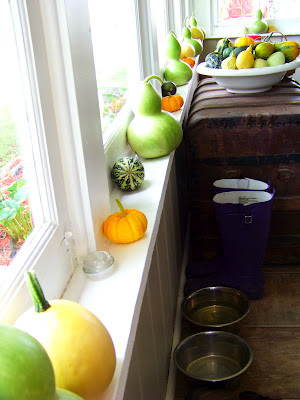 Don’t despair; this year, turn gourds and pumpkins into a three-dimensional fall decoration that will rival any old-fashioned Jack-o’-Lantern carving. Or carve the famous Community Chicken (templates included below)! 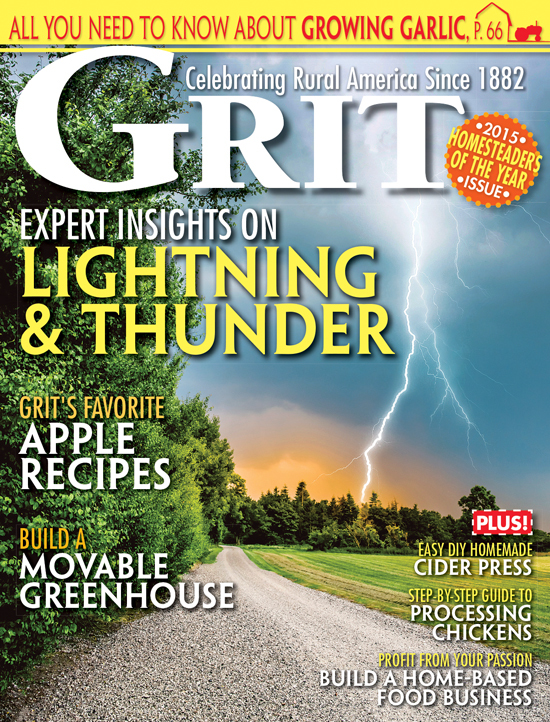 Carve, paint, or etch a pumpkin chicken, share photos with us, and you could even win a year’s subscription to Mother Earth News or Grit magazine! Enter using the form below! Hurry, you only have until Nov. 5, 2017 to submit your photos! We had an awesome pumpkin harvest this year at Iron Oak Farm. 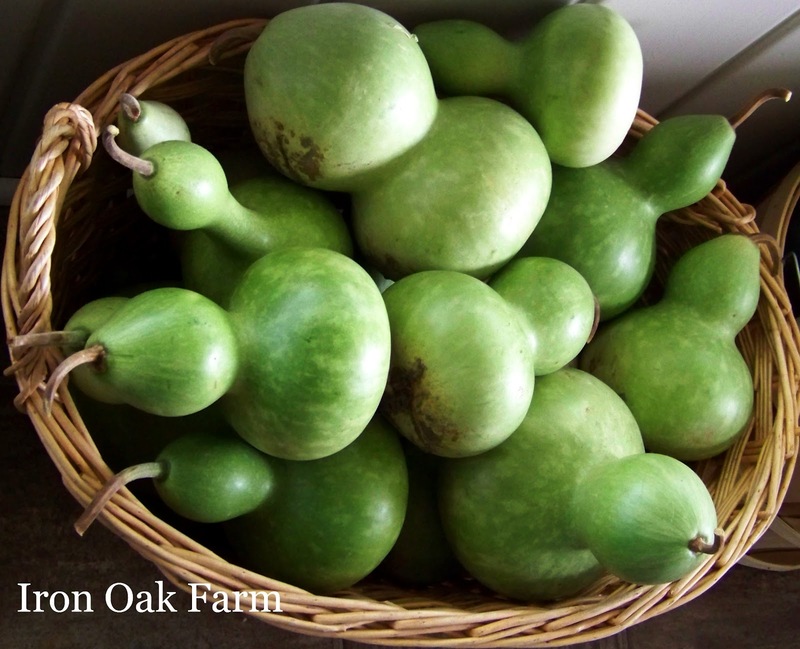 We grew many varieties of heirloom gourds and squash and the plants were abundant and produced tons of large beautiful fruits. The chickens have been having fun as well devouring the pumpkins little by little. One will start pecking the skin, then before I know it, there’s a hole and a whole group of chickens are eating the seeds and flesh. Our bumpy pumpkins seem to be extra fun for them, as they enjoy pecking the warts off the skin. I’ve let them be, as pumpkins are a healthy treat for chickens, and we have so many to share this year. All of this chicken/pumpkin interaction got me thinking of some creative ways to incorporate chickens into our Halloween fun! The birdhouse gourd and swan neck gourd’s natural shape reminded me of a fat little hen, so I went with it! Here’s how to make a Pumpkin Chicken for your front porch! Cut a wedge shape from a section of smaller pumpkin. This variety has deep ridges that resemble the arched tail feathers of a chicken. Clean the section of seeds and fibrous material. Use a broken skewer stick to attach the tail to the back of the Birdhouse gourd. The wings are made from a single Jack-Be-Little. Slice each side off on wither side of the stem. Clean the seeds and attach to either side of the gourd with a broken skewer stick. From another Jack Be Little, slice a wedge following the outline of the riges in the pumpkin. Cut this thin piece in half and you have the beak. Attach with a broken skewer. From the same Jack Be Little, slice a wedge of two ridges. You don’t have to go all the way through the pumpkin this time. Then slice this horizontally into the center. Attach with a toothpick. With the other half of that same Jack Be Little, cut the top half off in the same way you did the wattle. Attach with a tooth pick. With the third Jack Be Little, carve two sections each containing two ridges. Slice a “V” into the wedges to separate the toes. Attach the feet with toothpicks. You can be creative with the eyes. Use black pom poms or those plastic wiggle eyes found at craft stores. I was going for a fall”natural” theme, so I used two small acorns. I used a serrated knife to create two holes just large enough to wedge the acorns in place. 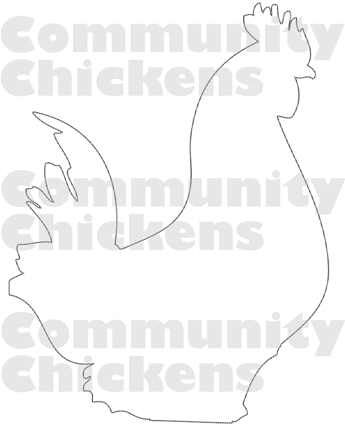 You can download the Community Chickens logo and carve it, as Phillip Earhart did here. Instructions: Tape the template to your pumpkin, and use a small screwdriver or knife to poke holes (like connect the dots) along the chicken’s edges. Remove the paper and carve to connect the dots. 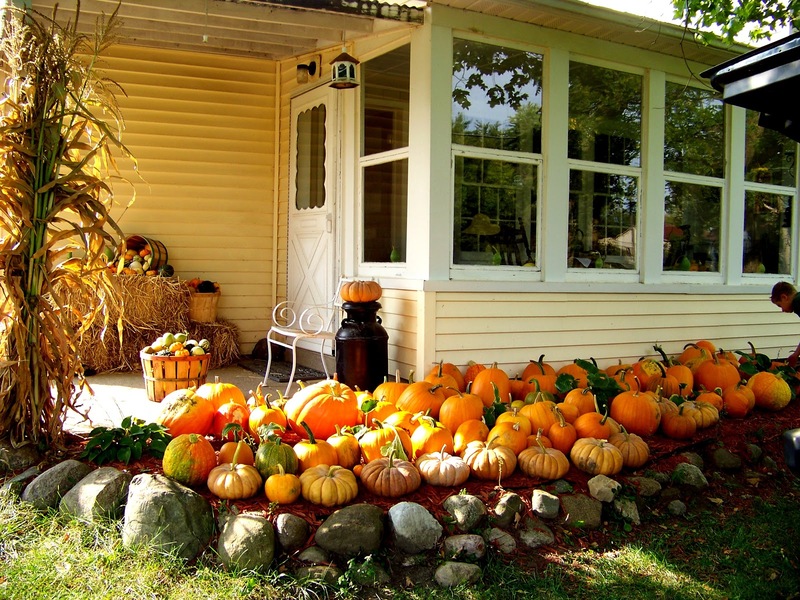 There are many different combinations of gourds and pumpkins that could be arranged into a chicken shape. And Happy Halloween from Community Chickens! This beautiful pumpkin rooster was carved Jamie Lynn Walski of Virginia. The creator of this little hen is Lori Unruh Lohrenz who says: ” I’m not good with knives, but here’s my painted chicken pumpkin.” We absolutely love it! Reader Max Noia shared this carving with the title “Scary.” Anyone recognize it? Tony Tran of Wisconsin decided to carve a chicken predator just to be contrarian. Phillip Earhart’s Community Chicken was so fun, we decided to share it again! 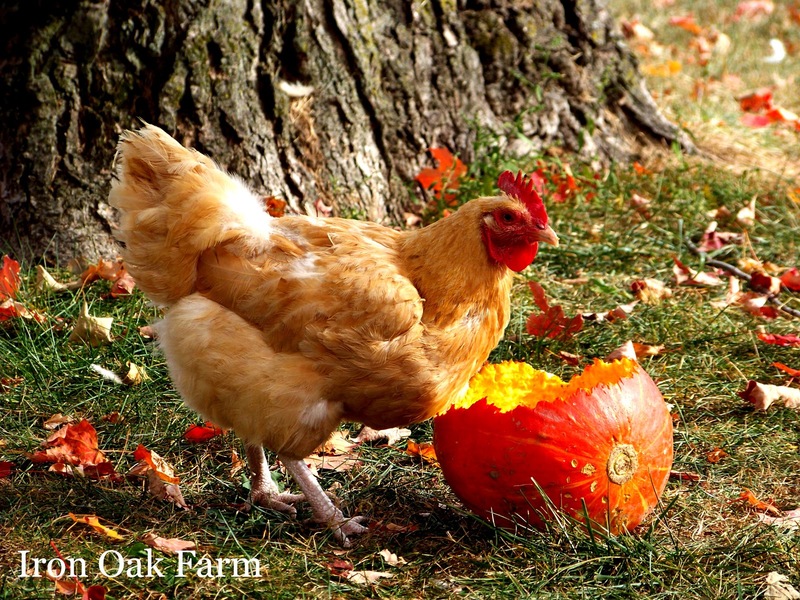 “The important thing is this pumpkin thinks it’s a chicken!” said Colleen Goldrick of Florida. Christina Walton Swenson of Tennessee shared this photo of her sisters carving their pumpkins. Enter the Community Chickens Pumpkin Decorating Contest! Enter the Community Chickens Giveaway! 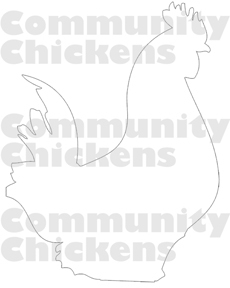 Can you share the pattern for the community chickens silhouette? 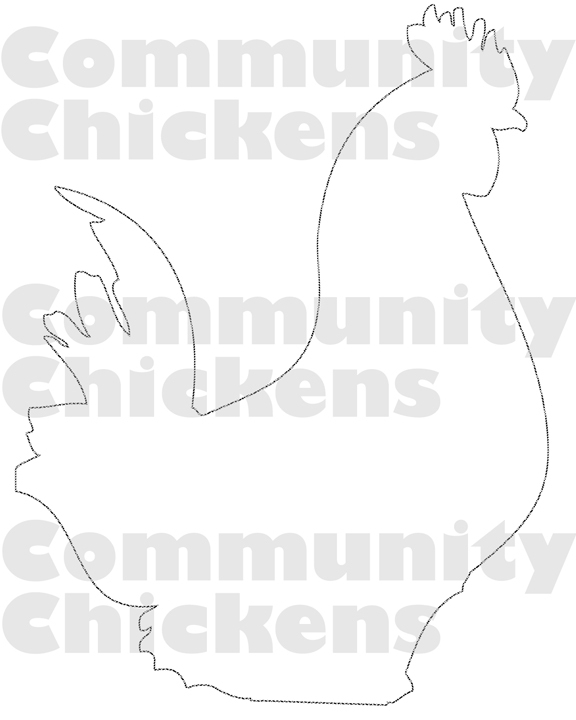 Can you share the pattern for the community chickens silhouette? I’d like to print it off and apply it to a pumpkin.